In 2003, neuroscientist Dr. Leonard Aldes was diagnosed with lymphoma. After two rounds of treatment, including a stem cell transplant, he's now cancer free. 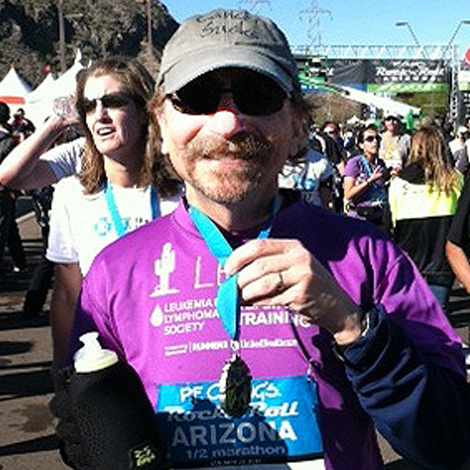 Dr. Aldes had been running for 33 years and refused to let lymphoma stop him. He and his daughter, Jamie, decided to join Team In Training to run a half marathon together. Dr. Aldes trained in Scottsdale, while Jamie trained on her own through the Flex Program in Cleveland. They both came together recently to run the half marathon side by side. "I can't express my gratitude enough to The Leukemia & Lymphoma Society and Team in Training," says Dr. Aldes. "I will continue running until we find a cure for cancer."